I LOVE New York style thin crust pizza. It’s my favorite. Especially a good slice dipped in ranch dressing…I know, classy right? lol. Unless the pizza is SO amazing it doesn’t need ranch, but pizza dipped in ranch is probably the best combination, if you’ve never tried…Get on it. Anyway, there are a couple Mulberry Street Pizzarias around LA, one on Canon and Beverly Drive in Beverly Hills, & one in Sherman Oaks and Encino on Ventura Blvd. It’s just a casual pizzaria, nothing fancy. After having the best pizza I ever had in my life in Brooklyn, (read my blog posting about Di Fara pizza in Brooklyn, New York), and Pizzaria Mozza which is “supposed” to be the best pizzaria in Los Angeles, I heard a lot about Mulberry Street pizza and decided to give it a shot. I’ve been to the one on Canon Dr. in Beverly Hills and the one on Ventura Blvd. in Encino. 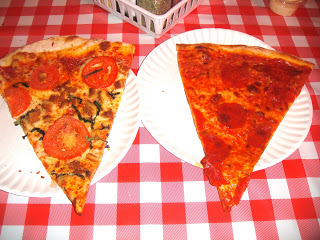 So if you want New York style pizza in LA, Mulberry Pizza is a well-known option! I agree, there is so much hype that Mulberry’s is the best pizza but it really isn’t so special. Its a good casual spot for getting a quick slice to eat. I’m looking forward to trying Pizzeria Moza. Thanks! this new place called Leaning Tower Pizza in Sherman Oaks is the Best, hands down.